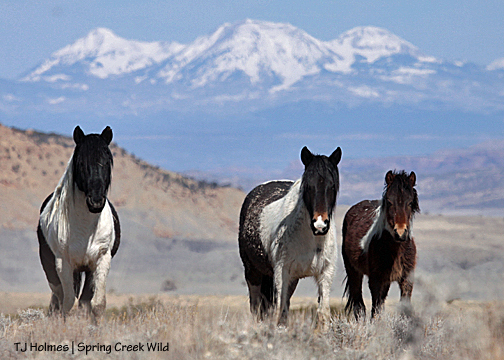 Corazon with Reya and S’aka in their high-desert home of Spring Creek Basin. Utah isn’t quite as close as the La Sals in this photo would have you believe, but it is fairly close. Note the mud on Reya. The Round Top pond is holding a decent amount of water. Three ducks thought it quite fit the bill, too! Seven’s ladies seem to be feeding him well. Puzzle is behind him, and you can just see Shadow at bottom right. Grey/Traveler, center, drinks from a pond with his band, from left: Alegre, Maia, Mariah and Houdini. Water is the most precious resource of all in this high desert region. 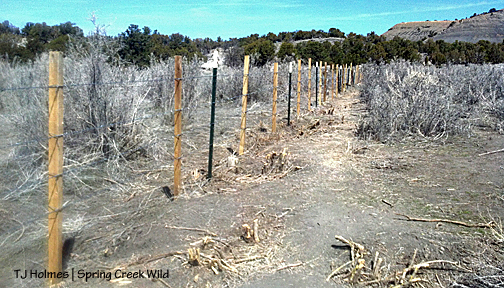 Boundary fence – aka the fruit of the students’ labor! When the students finished work on the fence Tuesday, I was so excited, I forgot to take pix of said finished fence! So yesterday, on a near-perfect spring day in Disappointment Valley, I straddled my mountain bike for the first day this year and pedaled up to the boundary. I haven’t figured out a decent way to carry my camera while biking (it’s not little), so I apologize in advance for the crappy quality of these cell-phone images. But I believe they show the excellent quality of our new, student-built fence! I say, isn’t that a rockin’ mountain bike! Oh, wait, I mean, isn’t that a *tight* H-brace! 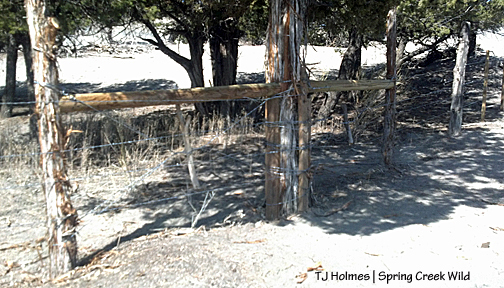 This is at the road (the cattle guard is immediately to the left), and the brace was loose. Despite the poor image quality, I think you can see the shiny new wire. The sign says something about no motorized vehicle access (because it’s McKenna Peak Wilderness Study Area). This was shot from in front of my bike looking up the fence line. Does it rock or what?! This is from the other (west) side of the fence, looking back toward the road, but it’s the same section of fence. The shadows don’t allow for much detail in this shot, but this is the first H-brace the students built, using the tree as the anchor. Notice the extra “padding” around the tree. Here’s a closer view. 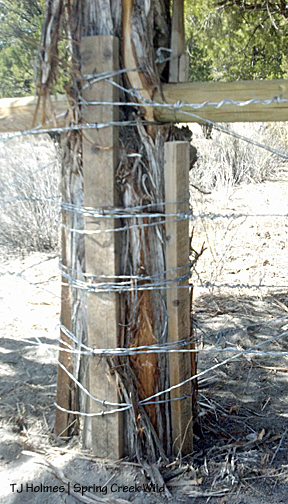 The staves protect the tree from wire biting into the bark – thank you (again), Tom Kelly, Forest Service fence-builder extraordinaire! This is the brace just to the left of the tree and shows – I hope – the somewhat intricate weaving of the wrap, which holds it all together. And here’s the fence continuing on up the hill. 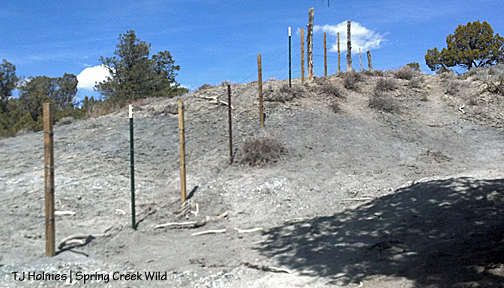 Kudos again to the students for building this wildlife-friendly, mustang-protecting fence! With the H-braces set in place, the day’s plan was to take out the old wire and string new wire. 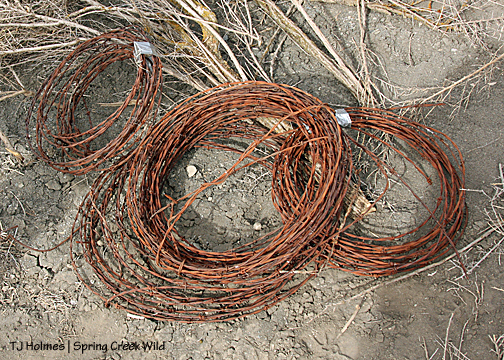 Following wildlife-friendly strand spacing, the top wire is smooth twisted wire and 42 inches above the ground. The bottom wire is smooth twisted and 18 inches above the ground. The middle two strands are barbed wire. 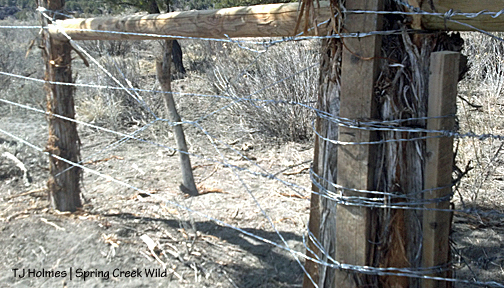 Deer and elk can jump over, fawns and calves can crawl under, and cattle hopefully will respect the barbed. So we had to cut wire pieces off the existing fence strands and pull staples and roll barbed wire. Gloves and shades were must-have accessories. 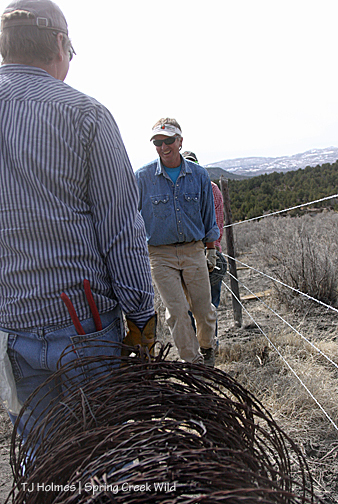 Once again, fence-building guru Tom Kelly showed the most jaded of us, who thought we knew a thing or three about fence building, a new technique to tighten the wire fence strands to T-posts (metal) and staves (between T-posts or wood posts). 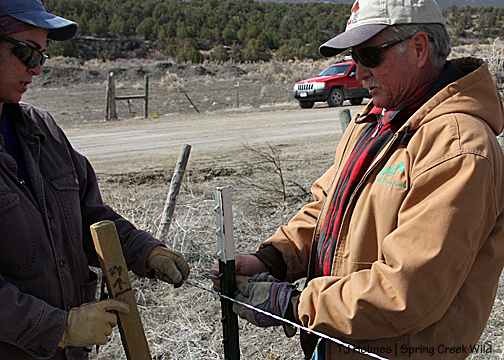 Tif watches Tom demonstrate the new-to-us tool to attach a wire fence strand to a metal T-post. 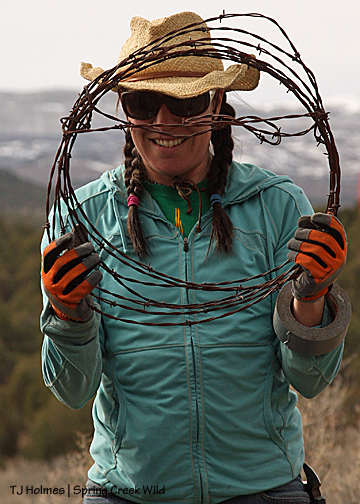 She’s holding a stave on which she has marked the heights of the wire fence strands. MK took over this “wonder tool,” and I’m not sure she ever let it go! Instead of a traditional “clip,” this is a short piece of wire with loops on both ends. The hook goes through both ends, you swivel it, and voila! Your wire strand is tight to the post! But I’m getting excited and ahead of myself. First, we had to get rid of the old wire. Here, Emerald demonstrates careful barbed-wire-rolling technique. MK and a “barbed wire wreath”! 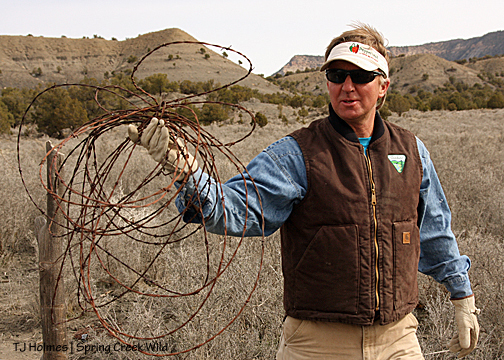 BLM guy Tom with his, uh, not-so-perfect “roll.” Lesson: Don’t let BLM roll up your fences! Fortunately, he redeemed his agency’s good name later with his wire-strand tightening skills. Students Chalen and Marissa help volunteer Keith unroll smooth twisted wire. Note the wire strand in the bottom left corner of the pic. It started at the road, tied off at the H-brace there, and was unrolled up to the first H-brace, which is just beyond Tom Kelly (back left), where the trees start. Then another strand is tied off there and the roll walked back to the road and that brace. The process is repeated with the barbed wire in this section, and then with the smooth and barbed wire strands from the H-brace behind these guys up the hill to the next brace. Keith carries rolls of old wire to the trucks while Tom and Chalen carry good wire to the next H-brace to string it from there to the third brace. Note the very valuable set of fencing pliers sticking out of Keith’s pocket. 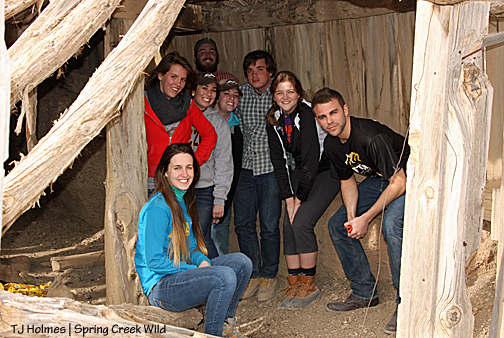 Students were well-acquainted with these tools after two days in Spring Creek Basin! Here, the bottom and top strands are in place and have been stretched (tightened). 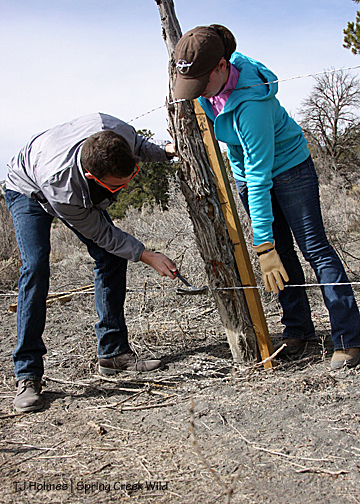 In this pic, Sarah and Aaron are measuring and stapling the strands of fence wire for the rebuilt fence. Note the marks on the stave Sarah is holding. The marks are at 18 inches, 23 inches, 30 inches and 42 inches. Marking staves made it easy for students to work in pairs: measure and staple. 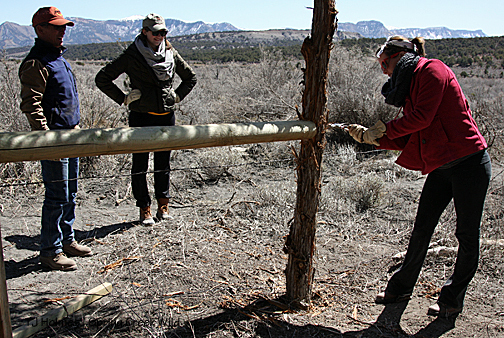 Emerald and Ellen, foreground, and Corrie and MK measure and staple fence strands to posts. Ellen and Emerald are at the next H-brace, up the hill. Front row from left: volunteers Corrie and Tif, Mizzou site leader Chalen and volunteer Keith. 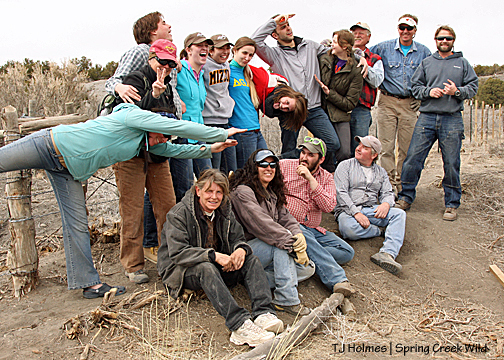 Standing: MK (diving) and Kathe with SJMA, students Marshal, Sarah, Marissa, Kara, Ellen, Aaron and Emerald, Tom Kelly with the Forest Service, BLM’s Tom Rice and Dave with the Forest Service. 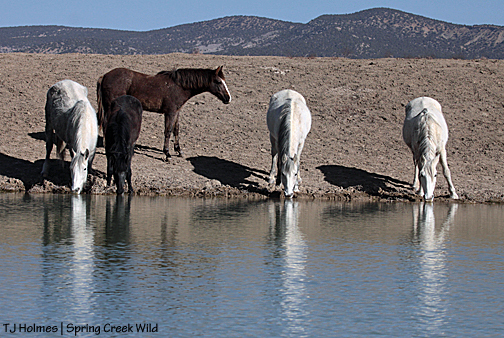 An important side note, Corrie, Tif and Keith all adopted Spring Creek Basin mustangs in 2011/2012. 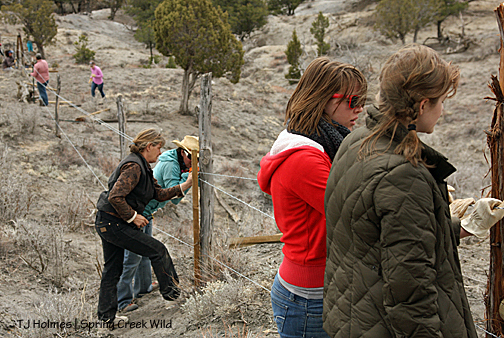 After their work on the fence, we took the students into the basin to scout mustangs. We saw Chrome’s band, Duke and Kreacher, Hollywood’s and Comanche’s bands with Bounce, and bachelor boys Aspen, Hayden, Tenaz and Apollo. Those boys were very accommodating for students’ pix! On our way out, we stopped to investigate the dugout, likely used during construction (way back when?!) of the defunct Custer dam. Chalen taking a well-deserved break. Word Monday was that he would be awake at 4:30 a.m. (!) Tuesday to cook breakfast. Students gather for a group photo op in the dugout. Are those some happy faces or what? 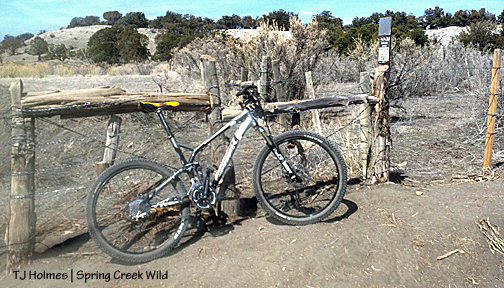 Today – Wednesday – the students will work with Kathe and MK and my friend Sam on one of my favorite mountain bike trails in Southwest Colorado: Phil’s World, just east of Cortez. It’s a not-so-secret course anymore. 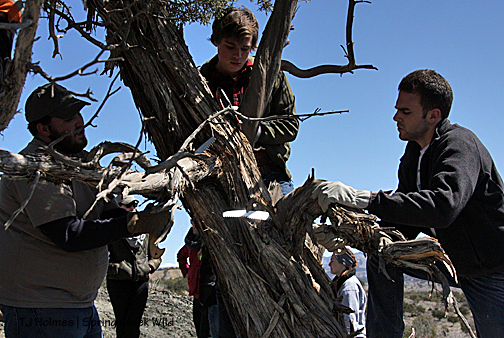 Thursday, they’ll work at Sand Canyon, part of Canyons of the Ancients National Monument, west of Cortez. Once again, huge thanks to these fantastic university students! 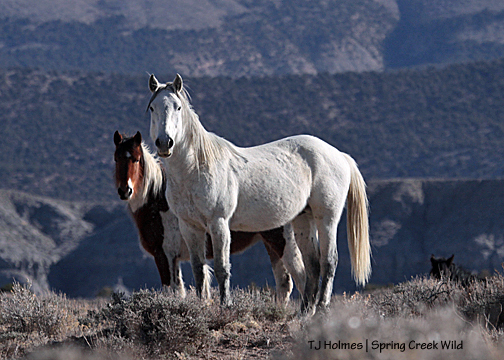 We so appreciate your willing and enthusiastic work to help protect our Spring Creek Basin mustangs. We hope you had fun to balance the work and that you’ll enjoy your next work projects as much as we enjoyed having you work with us! Come back soon to our corner of Colorado! 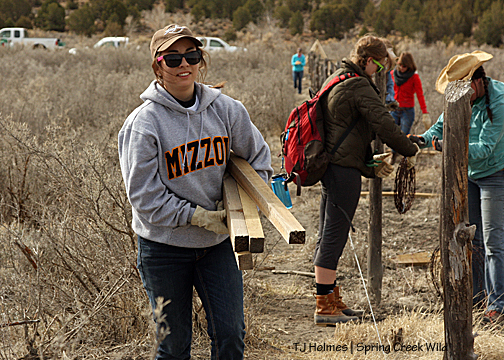 Monday was the first day of work for 10 students (including two site leaders) from the University of Missouri, here to work on public lands in Southwest Colorado on alternative spring break. Instead of going to Cancun or Fort Lauderdale or South Padre Island, these young men and women pursue service opportunities across the country. For more than a decade (13 years now? 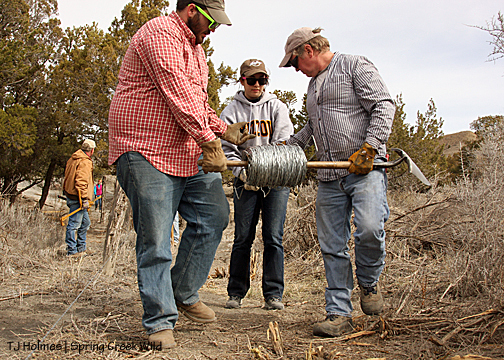 ), San Juan Mountains Association, a nonprofit partner with BLM and the Forest Service on San Juan public lands, has organized work projects that always include at least one day in Spring Creek Basin Herd Management Area. This year and last year, students will be and were here for two days. 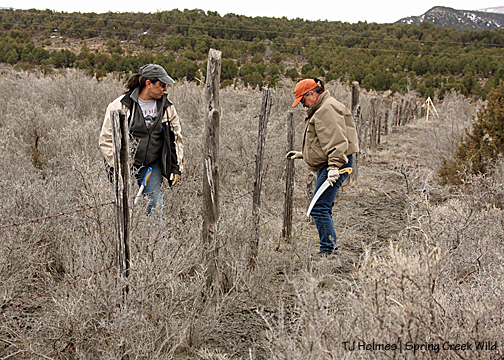 This year, as last year, students worked on the southeastern boundary fence. 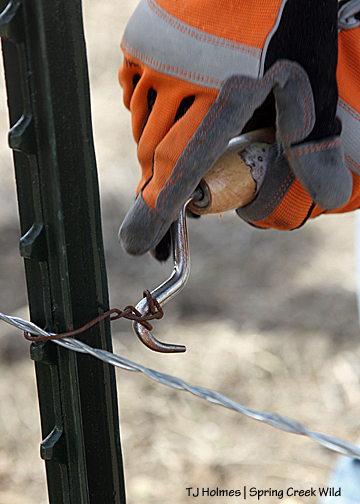 Last year, they rebuilt a section of fence that had been vandalized before the roundup (someone cut it in several places); this year, they’re installing braces, tightening some wire and replacing some other wire – maintenance projects much-needed on that fence line. 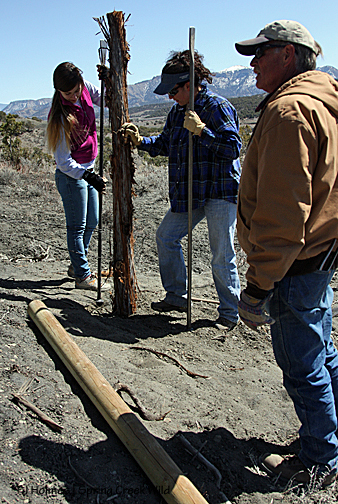 Volunteers from Mesa Verde and Four Corners Back Country Horsemen and the Colorado chapter of the National Mustang Association also are helping with the project. Some or all of the materials were purchased with funds from last year’s Director’s Challenge, awarded because of BLM’s partnership with Disappointment Wild Bunch Partners, made up of representatives from 4CBCH, MVBCH and NMA/CO. From SJMA, Kathe Hayes and MK Thompson, from the Forest Service, Tom Kelly, and from BLM, Tom Rice, were overseeing the project. 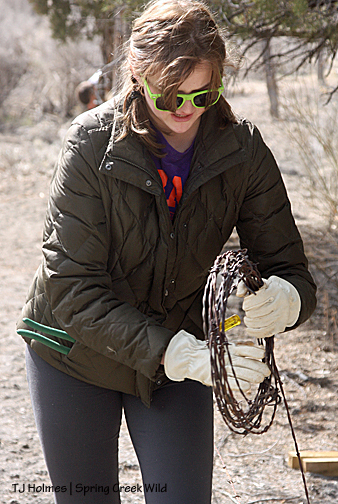 Sarah holds the wire strands to give Marshal room to dig a hole for a post as the first step toward building an H-brace. Four Corners BCH volunteer Bob Volger and student Emerald watch student Ellen pound in a stake to hold an H-brace to the post set in the hole dug by Marshal in the first photo. 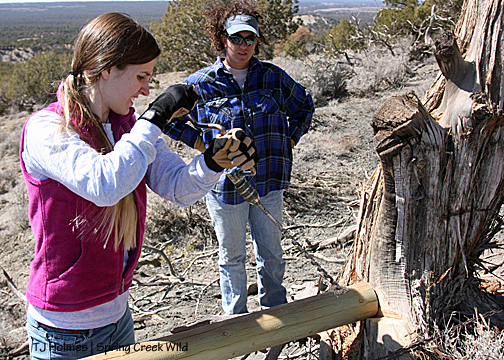 Student Kara helps Mesa Verde BCH and NMA/CO volunteer Tif Rodriguez tamp dirt around a post set at another H-brace while Forest Service fence-builder extraordinaire Tom Kelly supervises. 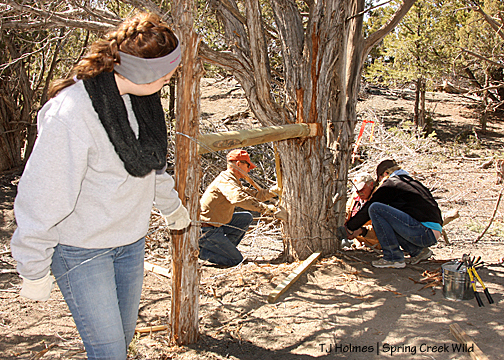 From left, Chalen, Marshal and Aaron saw limbs off a juniper to make way for building braces using the tree. Of the 10 students on the trip, these are the group’s only guys. Chalen is one of the site leaders. 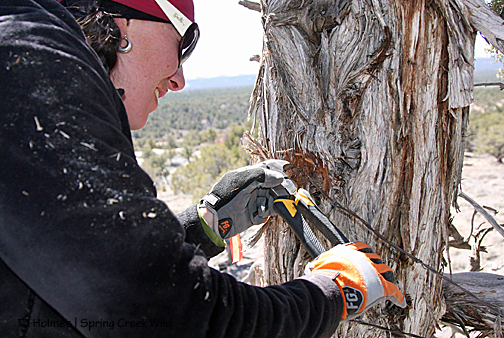 SJMA’s MK painstakingly removes staples from wire embedded in the juniper tree seen in the previous photo. Moving forward, each tree used for braces will get protective staves to prevent this from happening (thanks, Tom Kelly!). 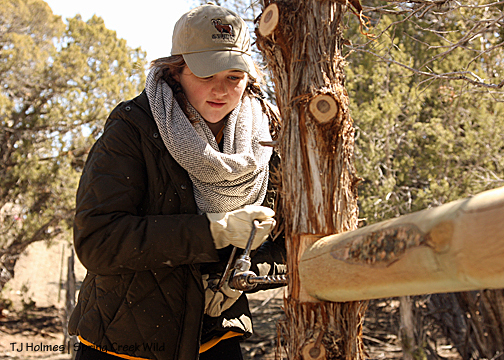 Tif watches while Kara drills a hole for a spike through the brace and tree for stability. Emerald drills the way for another spike in another brace. Altogether, three sections of braces had posts dug and posts set in place. 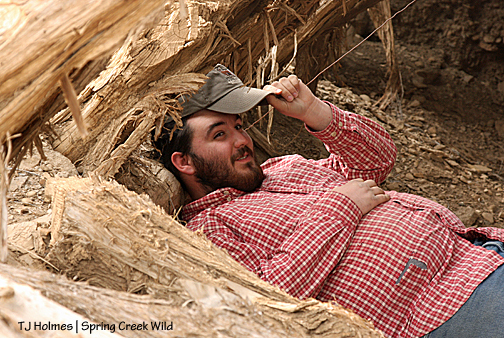 Because this area of Spring Creek Basin Herd Management Area also is part of McKenna Peak Wilderness Study Area, all the work had to be done by hand – no mechanical help such as chainsaws. 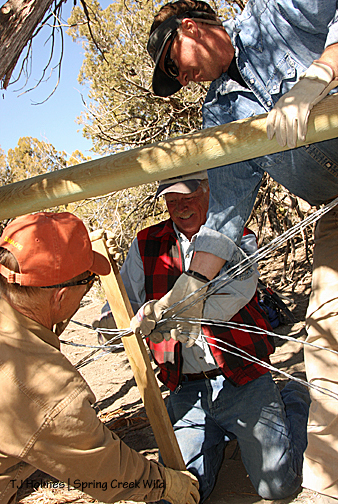 Sarah holds wire while Bob, Tom Kelly and Tori (also a site leader) wrap wire around the H-brace and tree (with staves) to tighten. Bob, Tom Kelly and Tom Rice do the last bit of work for the day: tightening the wire around the farthest H-brace for stability. Today, we’ll tighten and replace wire strands. Thank you to everyone who is helping with this project! We so appreciate your work ethic and commitment to our public lands! Raven’s hind hooves. 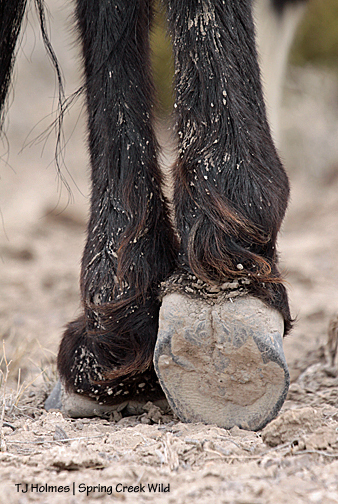 Wild, muddy, healthy hooves.